The newest edition from 2007, released partly because of the complaints the 2000 version caused. 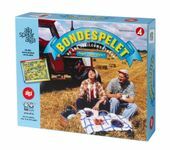 This version features a replica of the game board from the 1985 version. The replica was made by Anders Jeppsson (confirmed by author in 2010), although he's not credited in the game.